Drug therapy is the cornerstone of cancer pain management. An essential principle is to individualize the drug regiment for each patient. The effect of medications may vary widely from patient to patient. The side effects of medications also may vary widely between patients. Use the simplest schedule and the least invasive route of administration. (around the clock) to maintain a sufficient drug level for optimal pain relief. 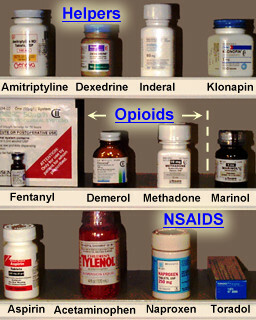 Provide additional doses of an analgesic as needed (rescue doses) for break through pain. Placebos have no use in the management of cancer pain. In spite of being able to predict how severe pain may be and whether the pain is nociceptive or neuropathic, patients vary in their patterns of pain. Pain can either be constant or intermittent. Pain that is constant responds best to drug therapy. An around the clock dosing schedule is ideally suited for constant pain. Intermittent pain is of greater challenge because of its unpredictability. Intermittent pain may be best managed by a prn administration of an appropriate analgesic. Breakthrough pain is an intermittent exacerbation of pain in a patient taking around the clock analgesics. Breakthrough pain is a common phenomenon in patients receiving an around the clock dosing schedule. It can occur spontaneously and unpredictably or it can be related to specific activity (incident pain). "Rescue" analgesics must be administered when breakthrough pain occurs or in anticipation of the activity that causes pain when the problem is incident pain. Analgesia is established then the patient initiates additional doses within confines of prescribed dosage (0.02-0.04 mg/Kg) with a minimal dosing interval (lockout interval) and a four hour dose limit. Constant pain responds to an around-the-clock dosing schedule, intermittent pain may be best managed by prn dosage.